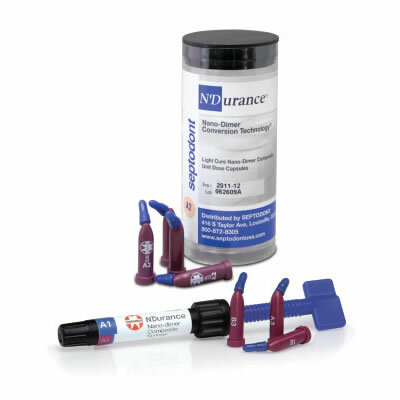 N'Durance Universal Composite is a light-cured, nano-dimer composite made by Septodont Inc., and used for direct Class I to Class V esthetic restoration of anterior and posterior teeth. With N'Durance, restorations are more durable due to its lower volumetric shrinkage, causing less stress on the tooth restoration interface. Works well with all bonding agents. Extremely radiopaque for long-term follow-up of restoration. Available in 12 Vita shades as well as Universal Opaque and Bleach White to offer a complete color palette.